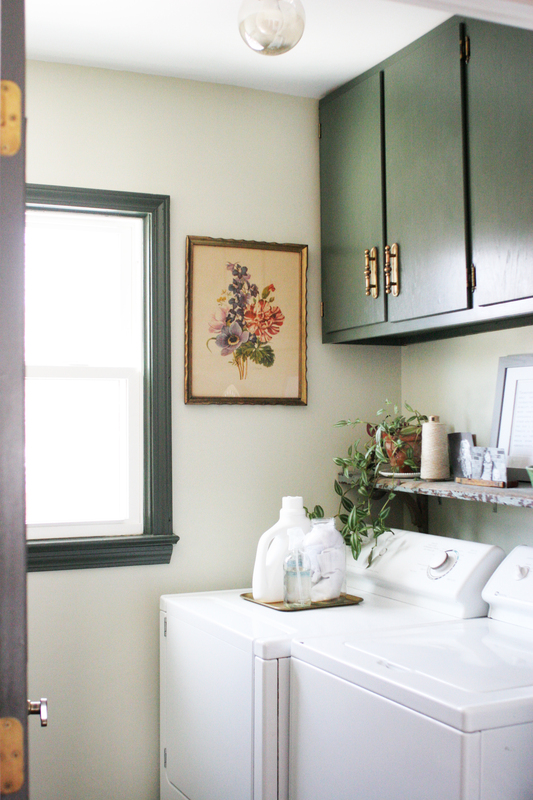 Take a tour of this beautiful vintage laundry room with dark green cabinets. 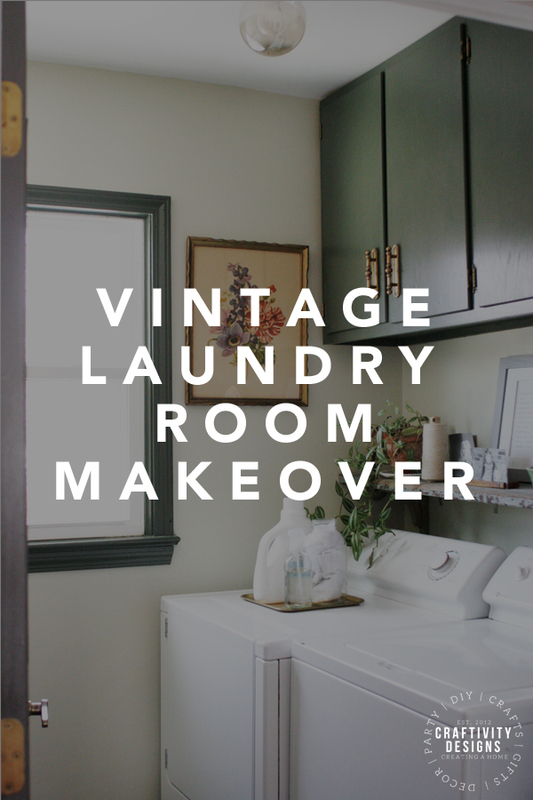 It’s packed full of storage with vintage laundry room decor that is functional, stylish, and practical! Well, we’ve lived here nearly a year and I finally have a completed room to show you! Granted, it’s a small laundry room, but I’m still pretty excited to have something finished. 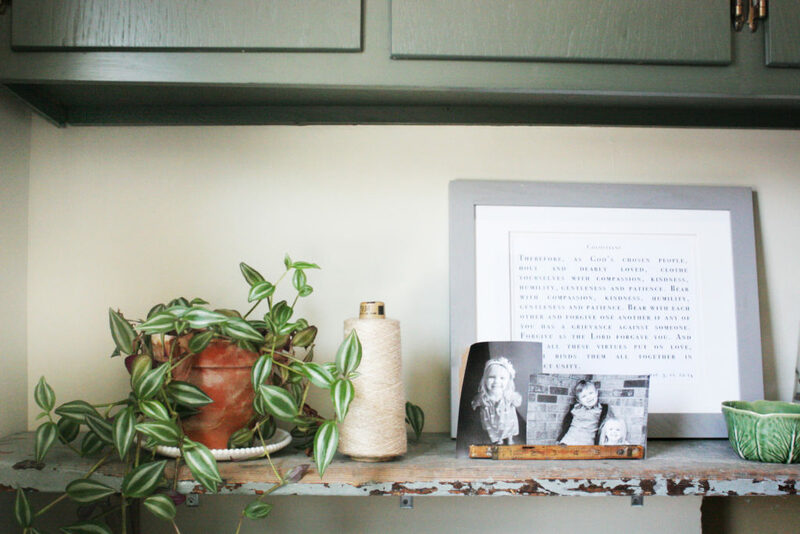 Our vintage laundry room fits perfectly into my vision for a modern cottage-style home with its eclectic mix of vintage, modern, and rustic details. Can I show you around? (1) I love to decorate small spaces. Small rooms can be bolder and it “feels” safe to stretch yourself from a design standpoint. Test the design decisions that you are hesitant to try in the main rooms of the house. (2) Sometimes, practical spaces are still very visible in daily life. Our laundry room is directly off the kitchen (if you take a look at the pictures in my rustic tablescape post, it’s right on the other side of the plate rack wall), and it’s even visible from the entryway (if the laundry room door is open). A well-decorated utility room is pleasing to the eye. (3) Utility rooms are typically on the smaller side and small rooms are more affordable to decorate. Not to mention, quicker to decorate, too! So, if you are itching to redecorate – but are tied by budget and time – decorate a small space. In small spaces, test the design decisions that you are hesitant to try in the main rooms of the house. Now, back to our small laundry room — let’s take a look at what it looked like before the makeover. Our laundry room is wide enough to hold the washer and dryer with a laundry basket in front of the dryer. 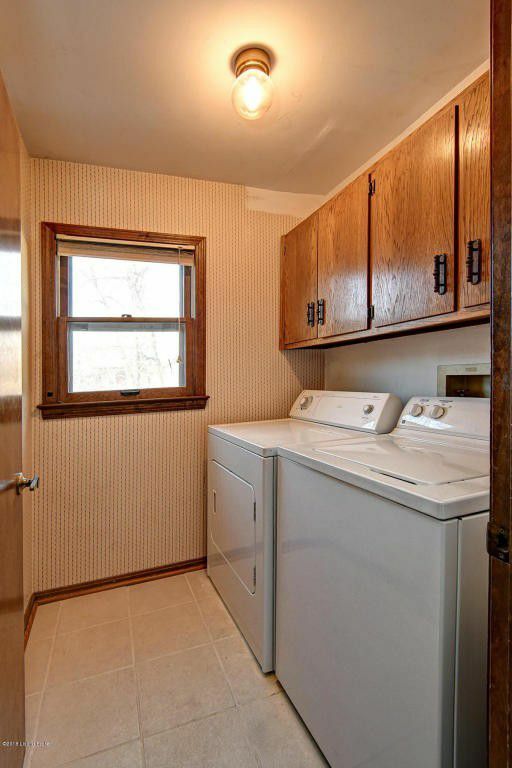 The door swings in, so the space in front of the washer can only be used to stand. Essentially, it’s approximately the footprint of a roomy walk-in closet. P.S. It’s actually bigger than our previous home’s laundry room. In our last house, the washer and dryer sat inside a closet. We actually removed the doors in order to open it up into the mudroom. 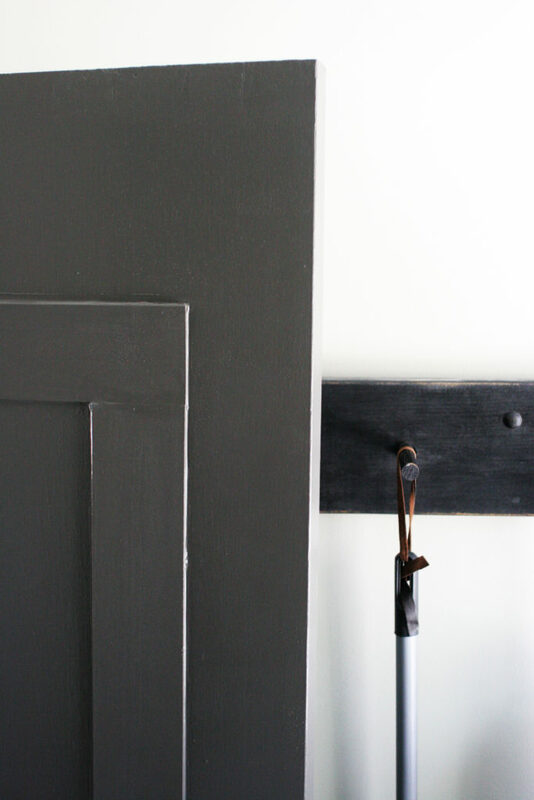 The first decision I made in the design of our vintage laundry room was to try a dark green paint. I’ve been intrigued by this look for a while (take a look at this inspiration photo). 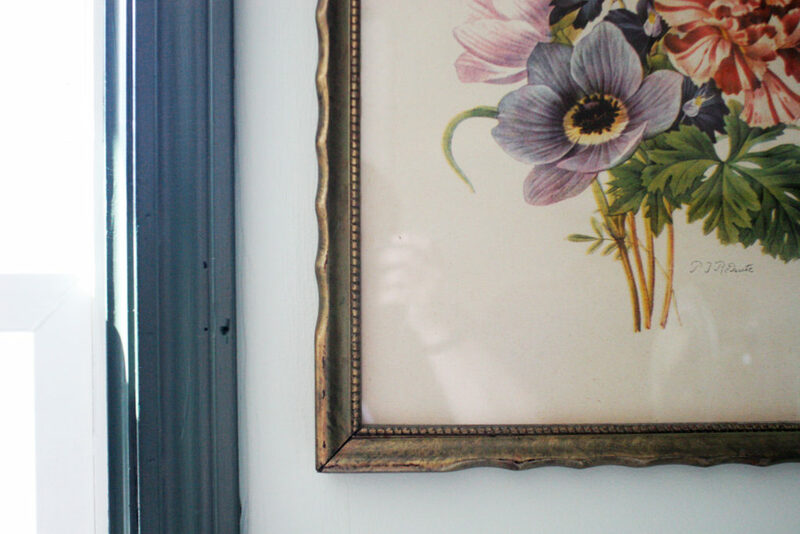 Shade Grown, by Sherwin Williams, is a bold color choice and outside my comfort zone. However — as I mentioned above — it’s easier to stretch outside my comfort zone since it’s a utility room. And, I’m so glad I did. I love the way it turned out. The dark green cabinets are striking, and the dark green window trim is unexpected. If you are hesitant about green cabinetry, check out this post which includes over 15 examples of homes with gorgeous green cabinets (ranging in colors from a light sage to dark hunter green). Rather than buy new hardware, I scrubbed the original hardware back to its original brass (scroll up 2 photos to see how dark they were before). 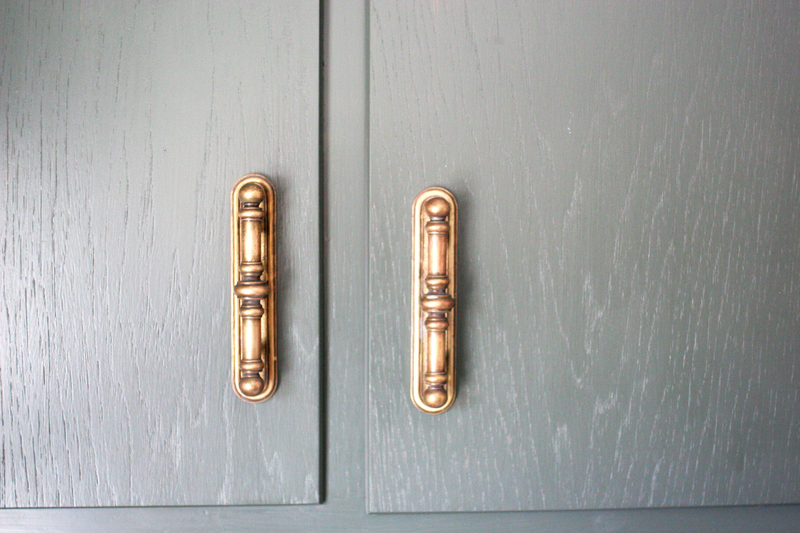 Instead of stressing over each nook and crevice, I left them darker, creating antiqued brass pulls. Underneath the cabinet, we installed a rustic shelf. This worn shelf has a backstory. We found it in our last home’s shed, left by the previous owners. It’s chippy character and muted gray hue, perfectly offset the modern aesthetic of the green painted trim and cabinetry. It adds warmth and texture, in what could easily become a stark room. a small green cabbage ware bowl. So, if you’re looking for vintage laundry room decor, look no further than your local consignment shop. I bought each of these utilitarian items at local thrift shops. Years ago this laundry nook stuck with me. I loved the idea to display family photos above the washer and dryer — where you spend so much time standing, staring at the wall, completing menial tasks. If I’m going to stand there folding clothes, I might as well see the sweet smiles of my kiddos in old photos. After all, that’s what Creating a Home is all about. 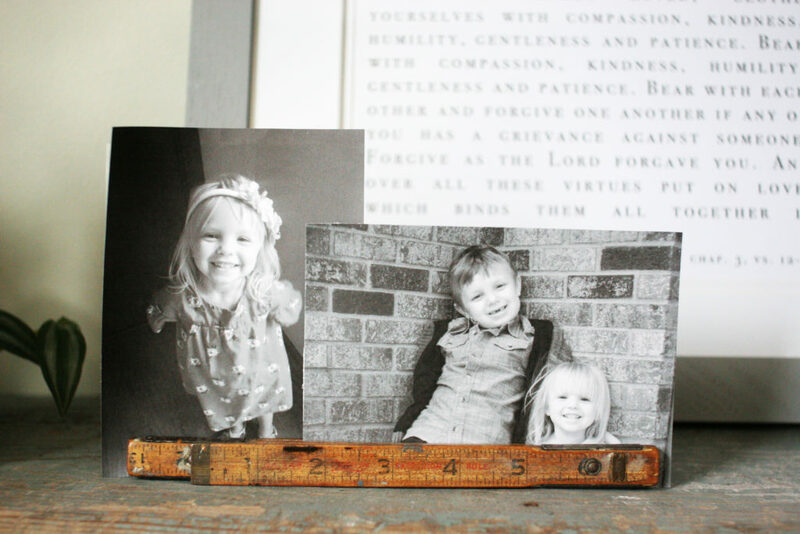 If I’m going to stand there folding clothes, I might as well see the sweet smiles of my kiddos in old photos. 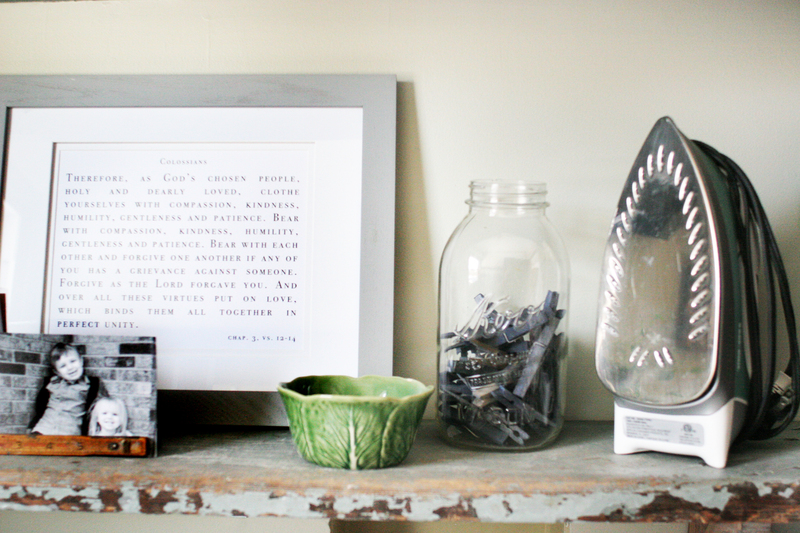 Speaking of finding meaning in everyday tasks… and Creating a Home… I also included a gray frame with a passage from Colossians. 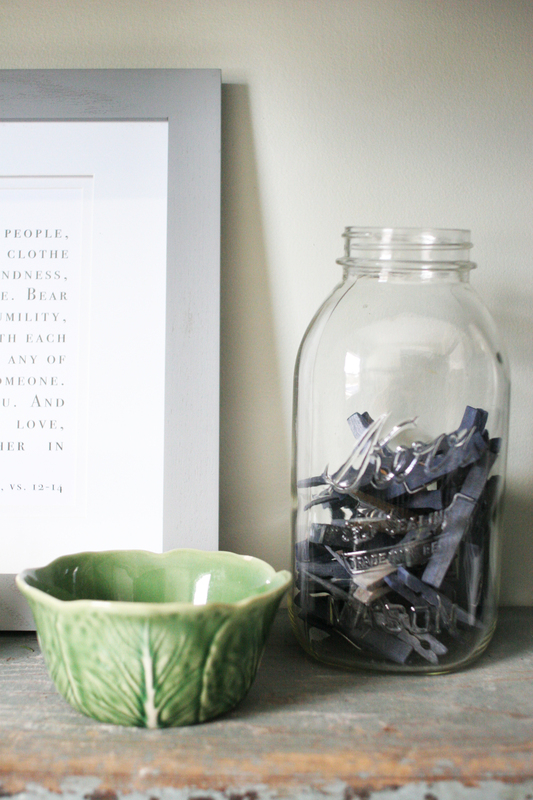 Though it happens to be “fitting” for a laundry room, the truths have been especially meaningful to my husband and me over the last several years. 12 Therefore, as God’s chosen people, holy and dearly loved, clothe yourselves with compassion, kindness, humility, gentleness, and patience. 13 Bear with each other and forgive one another if any of you has a grievance against someone. Forgive as the Lord forgave you. 14 And over all these virtues put on love, which binds them all together in perfect unity. 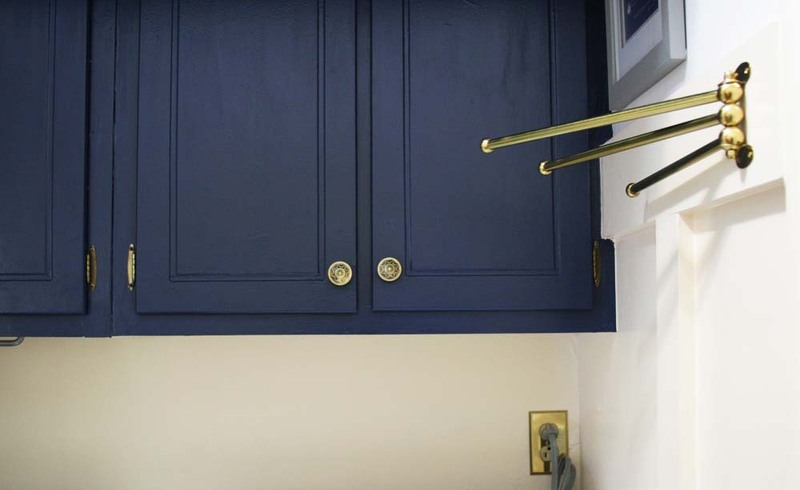 Like in our last laundry room, a large cabinet pull (or towel rack) is hung upside down below the cabinetry. 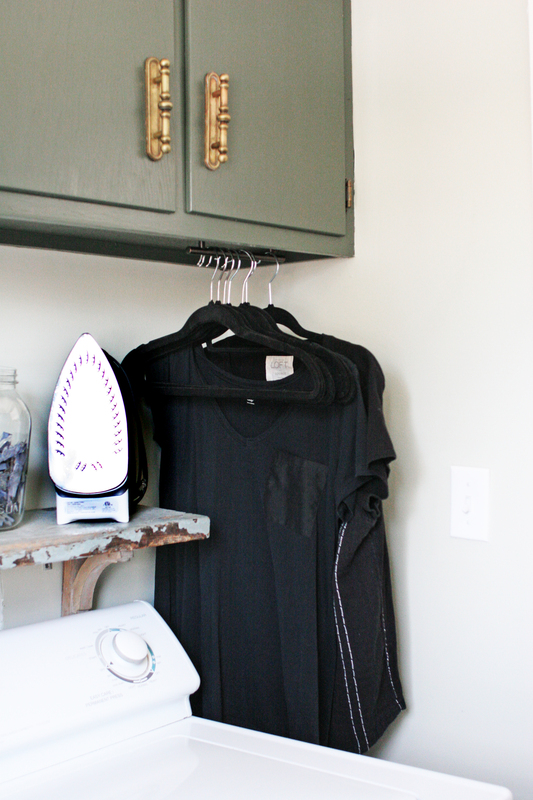 This is a quick trick to add hanging space in a small laundry room. On the opposite of the space, a Shaker-style peg rack spans the wall. 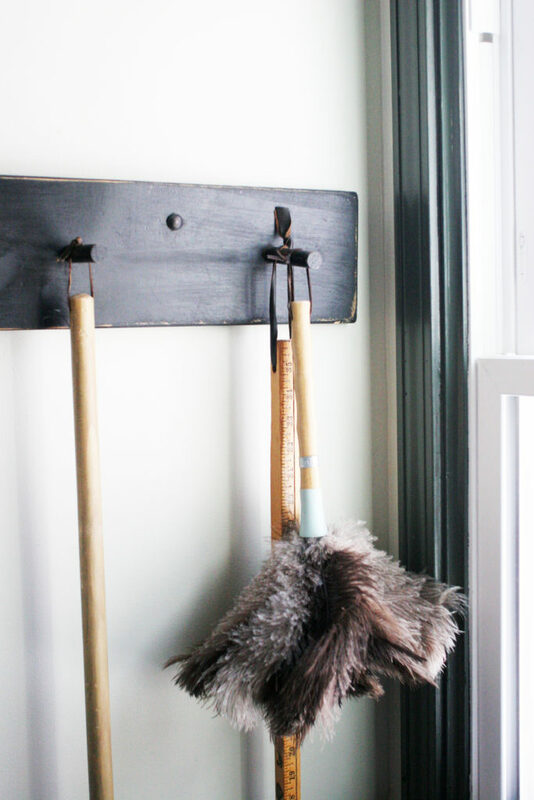 It holds brooms, mops, dusters, etc., even hiding some tools behind the open door. 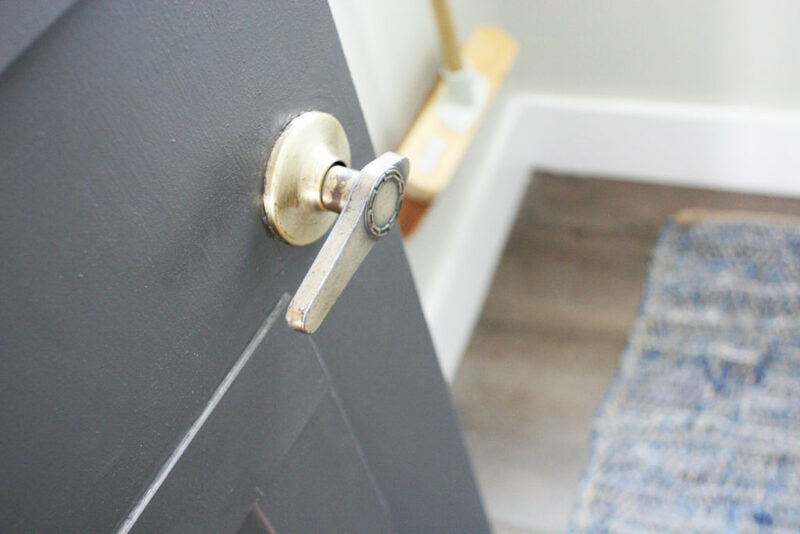 That door is another story, for another day… but here’s your teaser: It’s a basic, cheap, stained hollow core interior door. AND it cost about $16 to complete an interior door makeover. Again, we left the original brass door hardware to tie into the cabinet pulls (and save money!). The brass semi-flush mount ceiling light is original, too. Simple, understated, and well-suited to a vintage laundry room. A shiny brass tray and gold foil frame round out the metal finishes in our vintage laundry room. 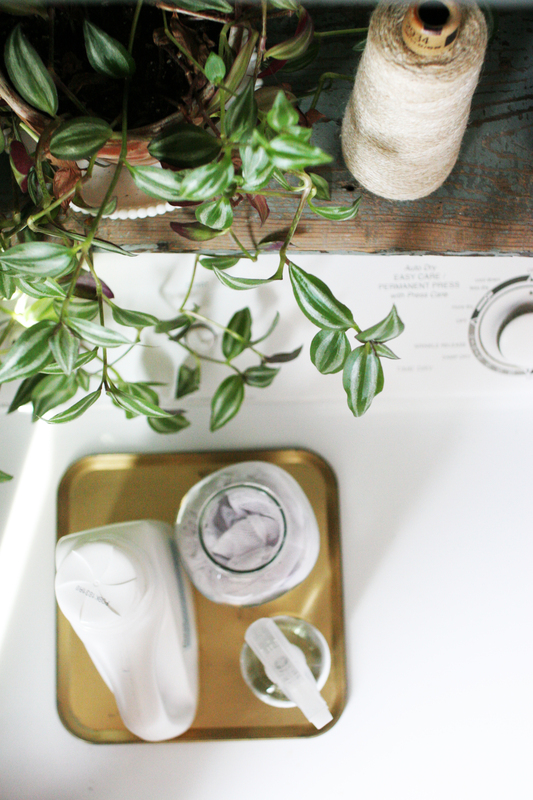 The frame holds a vintage floral print and the tray corrals daily essentials atop the dryer. So, would you like to recreate this look? 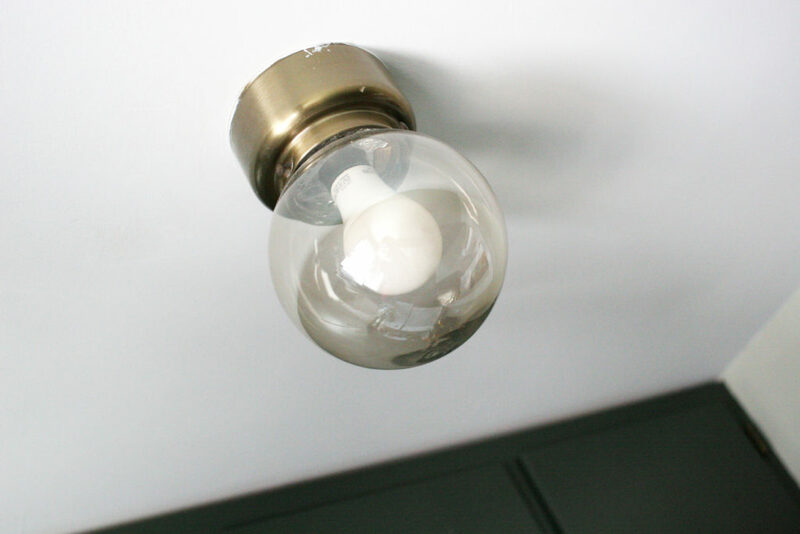 Here are sources (or similar options) for most items in my vintage laundry room. Hopefully, you’ve found a handful of small laundry room ideas from this vintage laundry room tour. If you are looking for more tips and tricks, check out our mudroom laundry room combo, and my favorite ideas for laundry room storage. One of my favorite tips for small spaces is adding board and batten with hooks along the wall. It’s a clever use of vertical storage when you are tight of floor space. 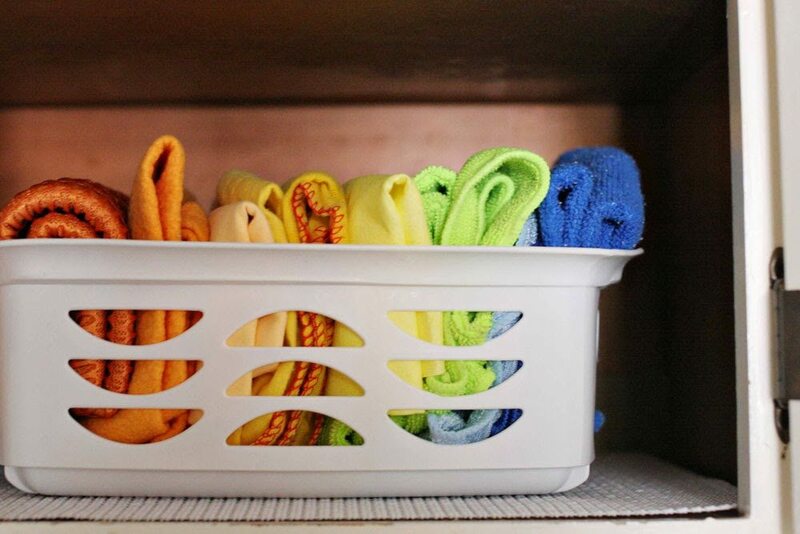 Is your laundry room small? What are your favorite ideas for keeping it organized and functional? I’d love to hear! Did you like this post? Save it by pinning it!